Instant Analysis: Gerrit Cole, Jameson Taillon and Stetson Alie. Don’t look now but the Pirates are stock piling pitching. Is this the same team that took Daniel Moskos over Matt Weiters 4th overall in 2007? Instant Analysis: Count me among the many that didn’t see this one happening. I say this as a Hultzen fan, but I don’t believe he has the ceiling of other arms such as Cole, Trevor Bauer or Dylan Bundy, but he’s more likely to get to his ceiling than any of them. I view him as a solid #2/3 who may make an All Star Game or two and that’s nothing to sneeze at. 3. Arizona Diamondbacks – Trevor Bauer – RHP – UCLA. 6’1″ 175. Last Drafted: Never. Instant Analysis: I had Hultzen here in most of my mocks, with Bauer landing here in my most recent post. The two time NCAA strikeout leader has over 200 in 136 innings this season. Instant Analysis: Best High School RHP prospect ever? I’ve had Bundy to Baltimore, who selected Dylan’s brother Bobby in 2008, since my May 6th Mock Draft. 100 MPH fastball, plus curve, plus cutter and an above average change up. Instant Analysis: Royals really wanted one of the 4 pitchers already selected and by most indications, they weren’t going to take Starling, the hometown hero with the Paul Bunyan reputation. Exciting for the best farm system in baseball to add a name like Starling. I’d still love to see him play for Nebraska in their first Big Ten season. 6. Washington Nationals – Anthony Rendon – 3B – Rice. Bats: R Throws: R. 6’0″ 190. Last Drafted: Atlanta Braves – ’08 (27th Round). Instant Analysis: The Nats wanted to make a splash and I thought they might do just that by taking Starling. They couldn’t have anticipated they’d land Rendon, who spent about 24 months atop the 2011 Draft Board. There has never been three more hyped first round picks to any club than Stephen Strasburg, Bryce Harper and Anthony Rendon. 7. Arizona Diamondbacks (for failure to sign Barret Loux) – Archie Bradley – RHP – Broken Arrow HS (OK). 6’4″ 210. College Commitment: Oklahoma (Football). Instant Analysis: This pick was bit of a surprise to me and I’m sure it wasn’t well received by the Indians who were on deck. This is an interesting pick as Arizona needs to sign this pick and Bradley won’t come cheap. The good news for Arizona is that they can spread Bradley’s bonus over 5 years as a two sport athlete. Allegedly hit 101 mph in his state championship game. 8. Cleveland Indians – Francisco Lindor – SS – Montverde Academy (FL). Bats: B Throws: R. 5’11” 175. College Commitment: Florida State. Instant Analysis: Lindor is the closest thing to Manny Machado in this draft but he’s a safer bet to stay at SS. I believe the Indians were set to take Archie Bradley with this pick, but Lindor is a pleasant consolation prize. 9. Chicago Cubs – Javier Baez – SS/3B – Arlington Country Day HS (FL). 6’1″ 205. College Commitment: Chipola JC. Instant Analysis: The first real wildcard in this draft, most prognosticators were all over the board on the Cubs. Baez is likely a 3B longterm but his stick is his strength. With arm strength to spare, catcher is another possibility, though that’s unlikely as it would delay his arrival. My guess is he’ll start his career at shortstop until it’s shown he can’t handle it. Instant Analysis: My comment from yesterday’s mock draft where I had Spandenberg going to San Diego at #25 “I wouldn’t rule out the Pads using the 10th overall pick on Spandenberg, so they’d love it if he fell here.” Though he’s the lowest ceiling player taken thus far, he’s no slouch. I don’t think he has enough power to play a corner infield spot and I question the glove to play 2B. But hey, Jason Kipnis is doing alright. Instant Analysis: Springer is a true five tool outfielder entered the season as a top 5 pick but both he and UConn started slow. He’ll have to hear about where he was selected second hand as he’s playing in his NCAA Regional Final as we speak. Instant Analysis: The Big 12 Pitcher of the Year, Jungmann has been one of NCAA baseball’s best pitchers three years running. He flashes a fastball, slider, changeup mix that collectively grades out as above average and at 6’6″, he throws downhill to generate natural sink and subsequent ground balls. Instant Analysis: One of the bigger shocks at this stage in the draft. No one had Nimmo going to the Mets but with his skill set, this is by no means a reach. A Wyoming prep product, Nimmo doesn’t even have High School baseball, so his tools in summer ball have captured the attention of local scouts. 14. Florida Marlins – Jose Fernandez – RHP – Alonso HS (FL). 6’3″ 235. College Commitment: South Florida. Instant Analysis: I really thought Mikie Mahtook would land here, but instead the Fish take the the Cuban born Fernandez defected when he was in high school. This is one of those picks that makes sense now that it’s happened, but we were too stupid to see it coming. 15. Milwaukee Brewers (for failure to sign Dylan Covey) – Jed Bradley – LHP – Georgia Tech. 6’3″ 205. Last Drafted: Never. Instant Analysis: Brewers college arms a plenty. First Taylor Jungmann at #12, now Jed Bradley at #15. My final mock yesterday had Bradley going to Milwaukee with the 12th pick, so it couldn’t have worked out better for the Brewers. 16. Los Angeles Dodgers – Chris Reed – LHP – Standford. 6’4″ 195. Last Drafted: Never. Instant Analysis: Not surprised that the Dodgers reached a little bit given that they have no money to spend. Reed is a legit prospect and while he serves as Stanford’s closer, he has three pitches (FB, SL, CH) so he’ll likely be given the chance to start as a professional. Though he was relatively unknown entering the season, Reed will play a huge role for the Cardinal this post season, and I’d love to see him lead this young team (8 underclassman regulars) to Omaha. 17. Los Angeles Angels – C.J. Cron – 1B – Utah – Jr. Bats: R Throws: R. 6’4″ 230. Last Drafted: Chicago White Sox ’08 (44th Round). Instant Analysis: Doesn’t fit the recent Halos M.O. but Cron is a legit college bat as he maintained his numbers with the new bats. He has plus power potential and should be a plus hitter overall. A former catcher, the arm is solid but he has no future behind the dish as a pro. Reminds me of a slightly bigger Matt LaPorta. Take that for what it’s worth. 18. Oakland Athletics – Sonny Gray – RHP – Vanderbilt. 5’11” 180. Last Drafted: Chicago Cubs – ’08 (27th Round). 19. Boston Red Sox (from Tigers for Victor Martinez) – Matt Barnes – RHP – Connecticut. 6’3″ 180. Last Drafted: Never. Instant Analysis: While I’m not as high on Barnes as others, he was dangerously close to coming off the board at #5 overall to the Royals so when you look at it that way, the Red Sox got a little bit of a steal. 20. Colorado Rockies – Tyler Anderson – LHP – Oregon. 6’3″ 195. Last Drafted: Never. Instant Analysis: Proud to say that my first mock draft, from January 17th had Tyler Anderson to the Rockies. (http://bit.ly/hKWYMG) Not so proud that I moved him all around the first round since then. 21. Toronto Blue Jays – Tyler Beede – RHP – Lawrence Academy (MA). 6’4″ 200. College Commitment: Vanderbilt. Instant Analysis: A rare Northeastern top prep pitching prospect, Beede sent out a letter asking clubs not to draft him because he will be honoring his commitment to Vanderbilt. Perhaps the Jays have something in place but they have a recent history of failing to sign high picks. Instant Analysis: Odd to say that at 5’8″, he’s one of the best hitters in the draft but he is. He won’t hit for plus power but he’s also not a slap hitter as he makes solid contact to all fields. 23. Washington Nationals (from White Sox for Adam Dunn) – Alex Meyer – RHP – Kentucky. 6’9″ 210. Last Drafted: Boston Red Sox. ’08 (20th Round). Instant Analysis: My comment from my final mock draft “If Alex Meyer were to slip, the Nats would select him before the Cardinals left the podium“. You can read about my thoughts on Meyer in my scouting report here. 24. Tampa Bay Rays (from Red Sox for Carl Crawford) Taylor Guerrieri – RHP – Spring Valley HS (SC). 6’3″ 180. College Commitment: South Carolina. Instant Analysis: Guerrieri came out of no where this year and was a potential top 10 pick two weeks ago. Tampa has a ton of picks (12 in the first 60) and they took the best player available. He has some makeup issues that may have caused the minor slide. 25. San Diego Padres – Joe Ross – RHP – Bishop O’Dowd HS (CA). 6’2″ 180. College Commitment: UCLA. Instant Analysis: The younger brother of Oakland A’s pitcher, Tyson Ross, Joe has a nice three pitch mix (FB, CB, CH). He tops out at 95 with the fastball but works at 91. He’s considered a tough sign away from UCLA. 26. Boston Red Sox (from Rangers for Adrian Beltre) – Blake Swihart – C – Cleveland HS (NM). Bats: B Throws: R. 6’0″ 175. College Commitment: Texas. Instant Analysis: One of my favorite prospects in this draft, the switch hitting catcher has an advanced bat and the ability to stick behind the plate. Though he’s raw as a receiver, his premire athleticism tells me he has the tools to develop behind the dish. His advanced bat may force a position change as catchers typically develop slower. 27. 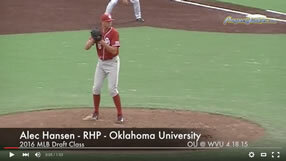 Cincinnati Reds – Robert Stephenson – RHP – Alhambra HS (CA). 6’2″ 185. College Commitment: Washington. Instant Analysis: Plus Fastball, Plus Curve but that’s about it right now. I thought he’d go to the Dodgers at #16 which would suggest he’s signable. 28. Atlanta Braves – Sean Gilmartin – LHP – Florida State. 6’2″ 195. Last Drafted: San Diego Padres – ’08 (31st Round). Instant Analysis: Not the highest ceiling, but he’s a safe bet to make it to the show. Possible comp would be Mike Minor who these Braves took #7 overall in 2009. 29. San Francisco Giants – Joe Panik – SS – St. John’s. 6’2″ 195. Last Drafted: Never. Instant Analysis: As much love watching them play, I’m always skeptical of guys that are described as gritty, hard nosed, and plays the game the right way. I think he’ll hit, but he’s not a shortstop. 30. Minnesota Twins – Levi Michael – SS – North Carolina. 5’10” 180. Bats: B Throws: R. Last Drafted: Never. Instant Analysis: Safe, sturdy and reliable. Minnesota Twins at their finest. Michael left high school early to get a jump start on his college career where he started at 2B for an Omaha bound Tar Heel team. He played 3B as a sophomore and is now playing SS. Probably profiles best as a 2B as a pro. 31. Tampa Bay Rays – (From Yankees for Raphael Soriano) – Mikie Mahtook – OF – LSU. 6’1″ 205. Bats: R Throws: R. Last Drafted: Florida Marlins ’08 (39th Round). Instant Analysis: After taking Taylor Guerrieri at #24, the Rays stick to the script and take the best player on the board. Mahtook could have gone as high as #14 to Florida. There are some comparisons to Rocky Baldeli and the Rays will take that. Instant Analysis: So much for sticking to script. Hager is a 3rd round talent who would have benefited from going to school. He’ll now likely sign for slot. Can’t blame the Rays for budgeting with a few of these picks. Instant Analysis: Small squirrelly looking kid who happens to throw 90 MPH. I think he’s a future left handed specialist out of the bullpen which would make him an unusual first round pick out of high school.